Congress failed to pass a budget and triggered a government shutdown for the first time in nearly two decades Tuesday. But Wall Street took Washington's latest breakdown in stride. The Dow Jones industrial average rose 0.4%, the S&P 500 added 0.8% and Nasdaq jumped more than 1% to close above 3,800 for the first time since September 2000. World markets also rose, while the dollar slipped against other major currencies. It may seem like a surprise that stocks were up this much. But the market had sold off during the past few days leading up to the shutdown. 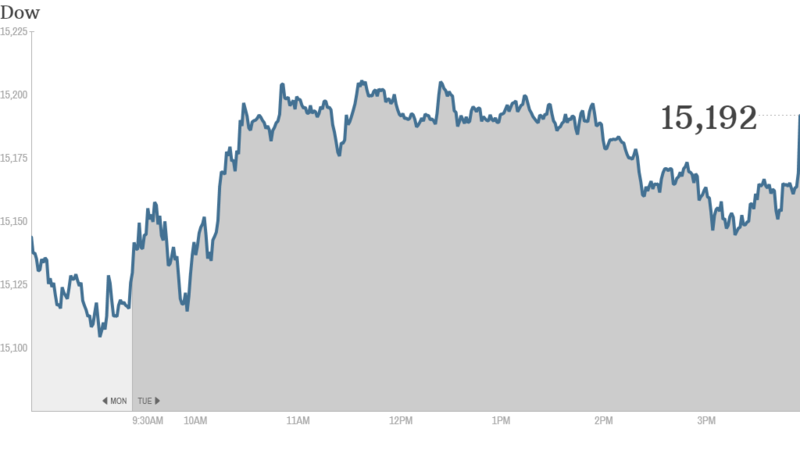 The Dow and S&P 500 declined for seven of the last eight trading days, including the Dow's triple-digit loss on Monday. Many investors are expecting the shutdown to be resolved quickly, risking little damage to the overall economy, said Joe Rundle, Head of trading at ETX Capital. Plus, the market is far more concerned about the looming debt limit deadline. If the government hits its debt ceiling in mid-October, it will not be able to pay all of its bills. "Republicans and Democrats must find some common ground and tackle their differences in order to formulate a new budget which will raise the debt ceiling," said Rundle. Icahn gives Apple a lift: Shares of Apple (AAPL) rallied after Carl Icahn tweeted that he met with Apple CEO Tim Cook Monday and "pushed hard" for a $150 billion stock buyback. Icahn added that the two plan to continue the conversation in three weeks, which will be around the time Apple releases its fiscal fourth-quarter earnings. The activist investor also revealed that he now owns a nearly $2 billion stake in Apple. The Icahn-Cook chat became a hot topic on StockTwits. "$AAPL TC listens to Icahn bc he needs him to pump this stock back to life and regain momentum...simple as that Bullish," said Bizfinder. But others said Cook should ignore Icahn's push. "$AAPL Carl want a $150B buyback....if I were Tim Cook, I would tell him to go fly a kite...rather make a major acquisition with that money," said goldengatesings2. Icahn first revealed that he has a large stake in Apple in August, and has been discussing his desire for a larger share repurchase program ever since. Apple currently has a plan to return $100 billion to shareholders over the next three years, mainly by buying back its own stock. Apple also pays a dividend. Manufacturing activity picks up: Investors were also keeping a close eye on the state of the manufacturing sector Tuesday. The Institute for Supply Management's monthly report showed that manufacturing expanded more than expected in September, with the index rising to its highest level since April 2011. Major automakers were also issuing their monthly sales reports throughout the day. Ford (F) shares rose nearly 2% after reporting a 6% jump in sales for September. General Motors (GM) shares slipped after the company said sales dropped 11%, compared with a year earlier. Toyota Motor (TM) also reported a decline in sales. Some car companies cited an early Labor Day as a problem. Since the holiday fell on September 2nd, many pre-Labor Day sales took place in late August. But traders thought that was a lame excuse. "$GM complaining about Labor Day sales, $F isn't! Bullish," said StockTwits user simonsays452. "$F Stronger sept than expected following great summer - Ford is crushing it!!! $F is eating $GM and $TM's lunch," added ShamanStockPicker. What's moving: Drugstore operator Walgreen (WAG) beat earnings forecasts, sending shares higher. Rivals CVS Caremark (CVS) and Rite Aid (RAD) were also on the rise. 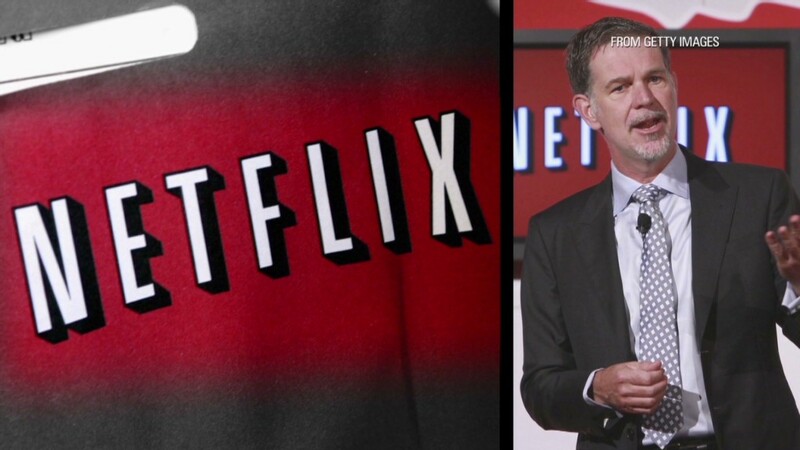 Netflix (NFLX) shares climbed 5% after MKM Partners raised its price target on the stock to $370. Shares hit an all-time high of $324.70 Tuesday. During an interview on CNBC, Icahn reiterated that he hasn't sold a single share of Netflix but also noted that given the recent run-up, he "won't say it's a no-brainer" to buy. While some traders interpreted Icahn's words to be bullish, StockTwits user Tstrar noted otherwise. "$NFLX holding not buying is what Icahn is saying, get a grip," she said. And gemczar21 added that "when Ichan dumps you will be the last to know." Shares of Merck (MRK) also advanced after the drug maker announced that it plans to cut 8,500 more jobs worldwide.